Nepal’s temperate climate, breathtaking scenery and ancient Hindu and Buddhist temples have attracted large numbers of tourists for decades. It is particularly popular amongst budget backpackers, as costs are lower than in many other parts of the region. However the majority of Nepal’s 30 millions inhabitants fight a daily battle against poverty and hunger, as documented in some of these photographs. 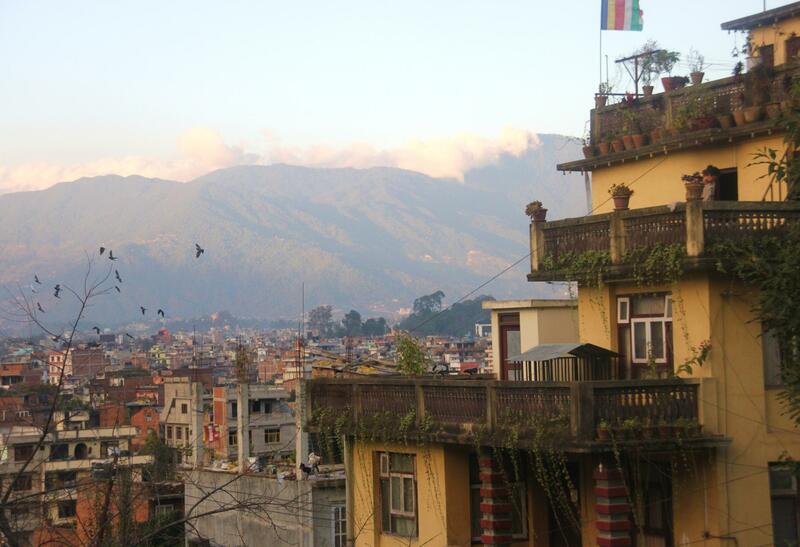 Nepal is therefore a nation of contrasts; a confusing mixture of extreme beauty and heart-rending hardship. It is a destination that is guaranteed to fascinate any visitor. These boys were walking home from a school in the outskirts of Kathmandu. 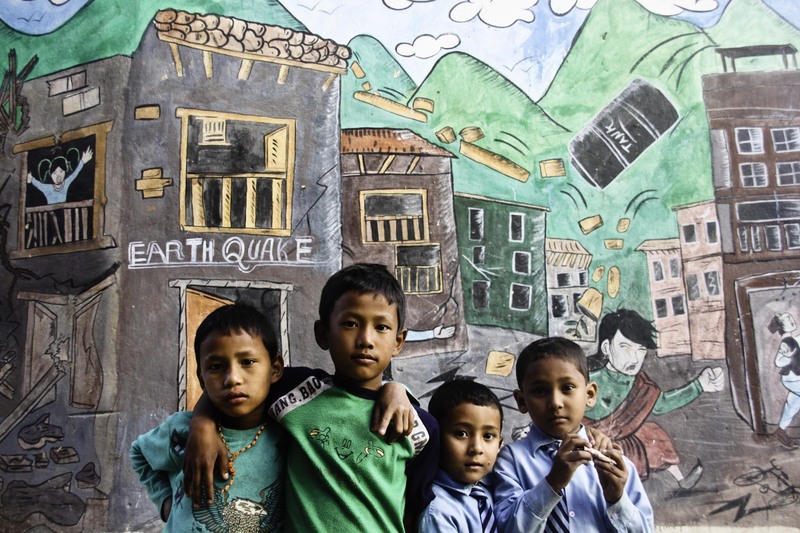 The mural behind them illustrates the chaos and destruction that affects a community during an earthquake. I’m unsure whether the mural serves as a warning, or if it commemorates past tragedies. Eleven thousand Nepalese died during earthquakes that took place in the twentieth century alone. Three million people currently live in the densely packed capital, and experts have said its infrastructure is inadequate to deal with such a calamity. 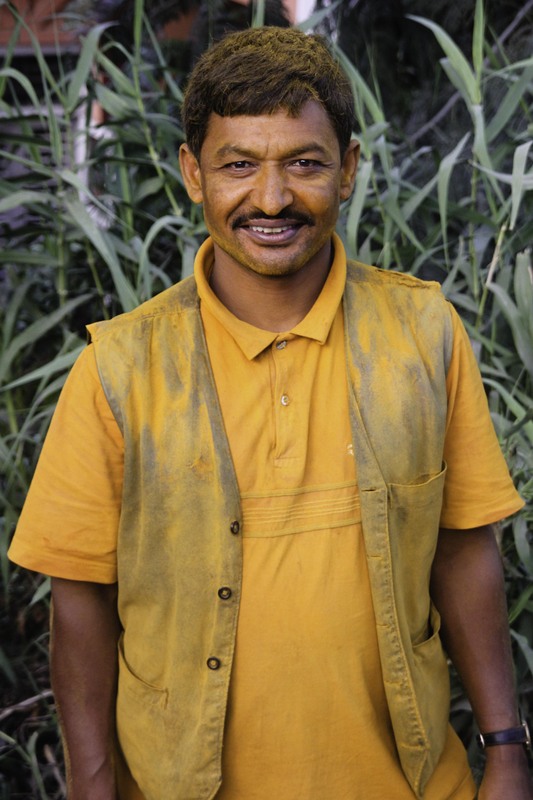 This man was just about to step inside his home in Kathmandu after spending a long day harvesting turmeric. The brightly coloured spice is grown widely in Nepal, as it is a popular ingredient in local dishes. Its healing properties are also well recognised; in Nepal, turmeric is used to treat liver problems, wounds, sinusitis coughs, and as an antiseptic for cuts. As in Bangladesh, turmeric is also used during a ceremony prior to marriage – the bride and bridegroom are covered in it to ward off evil spirits and to promote beauty. 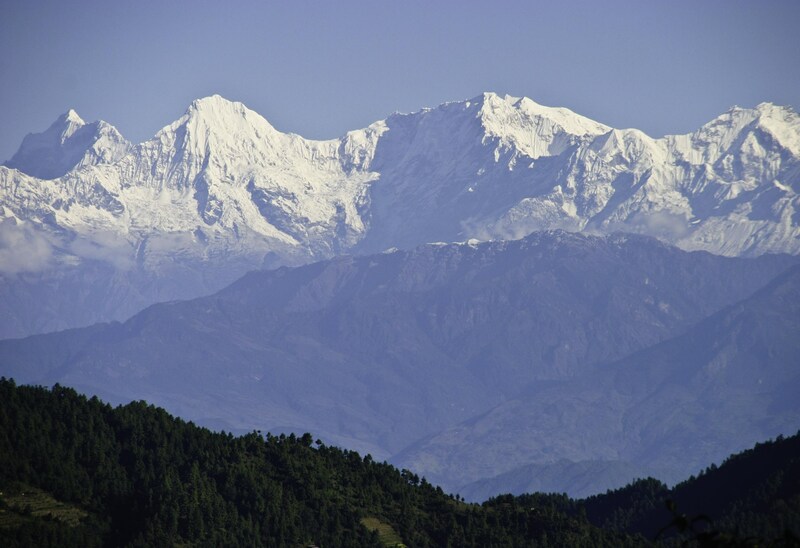 Thousands of tourists flock to Nepal every year to visit the Great Himalayan Range. This photograph was taken in the village of Daman, which offers the best unimpeded view of the Himalayas in the world. There are eight mountains above 8,000 metres in Nepal or on its border with China, including the world’s tallest mountain, Mount Everest. 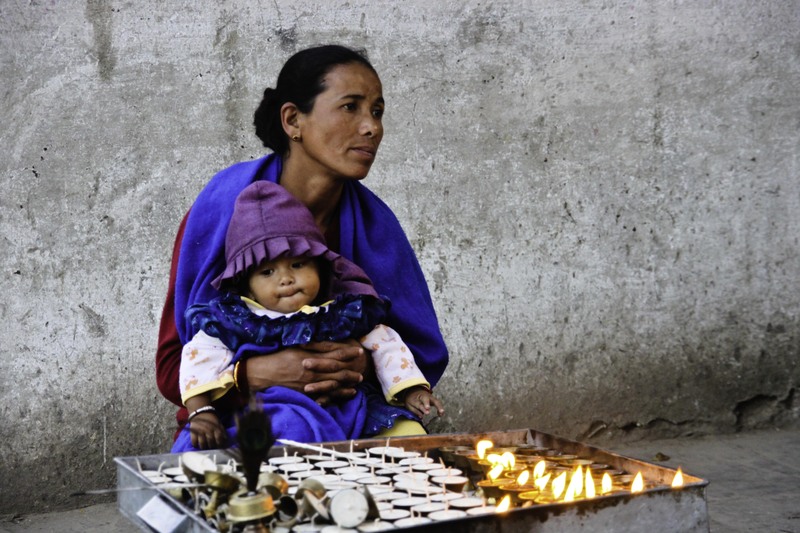 A mother anxiously scans for customers to buy the candles she is selling as alms at The Monkey Temple in Kathmandu. Unemployment is high in Nepal: around two thirds of women and one third of men are without work. The instability of the political system over the last few years is considered a major factor in the rise of unemployment rates. 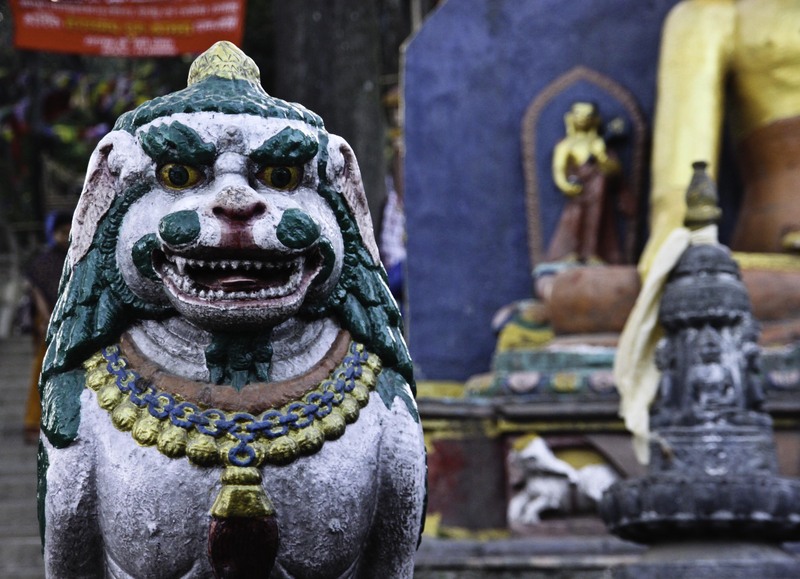 This eye-catching statue rests at the base of Swayambhunath Temple, which is also known as The Monkey Temple, located in Kathmandu Valley. It is one of the oldest religious sites in Nepal, and for followers of Tibetan Buddhism, it is second in spiritual significance only to Boudhanath, which can be found in the outskirts of Kathmandu. The name, “The Monkey Temple” arose due to the presence of holy monkeys in its grounds. Hundreds of monkeys play in the trees that grow beside the temple’s 365 steps. This impressive display of strength and endurance is common among the Sherpas, who are an ethnic tribe from the Himalayas. 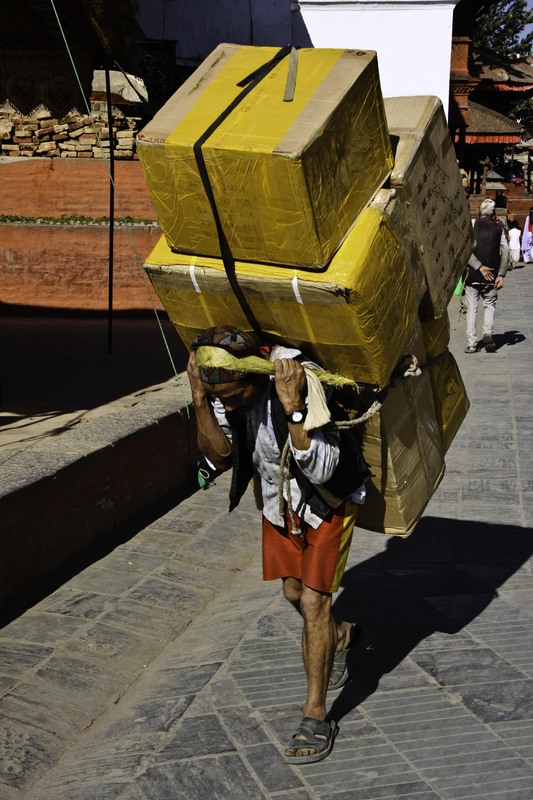 Sherpas are famed for their hardiness and expertise in high altitudes: and in Kathmandu, they are employed as labourers of goods. Experts speculate that their strength derives from a genetic adaptation to living in high altitudes, which includes lungs that have developed an increased sensitivity to low oxygen levels. Sherpas are comparably short in height, which accelerates circulation and allows them to extract more oxygen from the air. 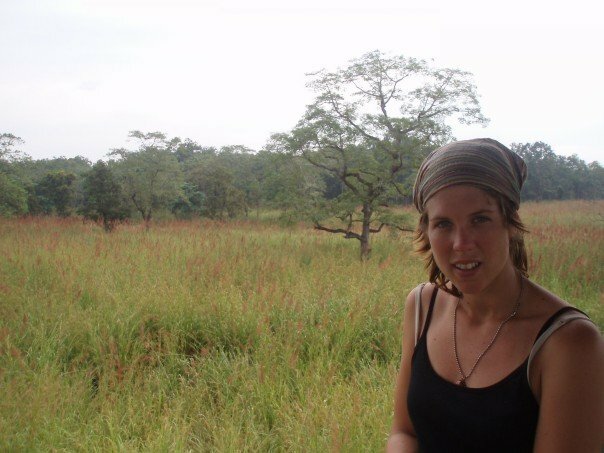 “I’m not walking through a jungle full of rhinos and crocodiles,” I hissed. I handed over another wad of cash to the booking agent. It was the equivalent of two days of my travel budget, but instinct told me not to scrimp on jungle activities. Sticking to momos at mealtimes for the next few days was inordinately preferable to meeting a grisly fate in Chitwan National Park. The surprising array of spiders that emerged from the timber slats in my bedroom that evening only reinforced my conviction. Kris and I arrived at the meeting spot shortly after it was lit by a misty sunrise. Two athletic-looking men of wildly different ages ushered us onto the back of a small pick-up truck with a wave. I patted its sideboards as I would an old dog, and let out a few relaxed yawns. An hour or so passed before we pulled over at a dilapidated eatery overlooking the Narayani-Rapti River. Kris and I slurped down sickly sweet coffee and bickered above the birdsong. Since meeting at Mount Everest’s base camp three weeks earlier, our quarrels had become increasingly regular — and depressingly trivial. I felt sorry for the guides, who no doubt already realised they’d lucked out for the day in terms of atmosphere. For the time being, I was grateful that they appeared to understand little English. 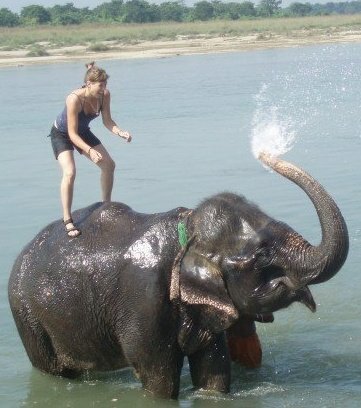 Elephant and Jessica bathing in Chitwan - a more relaxed activity than jungle safaris!! Absorbed by irritation, I stomped my way onto a log canoe without bothering to ask where we were headed. I assumed the pick-up truck would be there to collect us and focused my attention on the scenery. The barely-there current betrayed a false sense of calm, which could be broken at any moment by the snapping jaws of a crocodile. A waiter in Chitwan’s tourist hub of Sauraha had told me that their numbers in the park are plentiful – and that an adult male “mugger crocodile” had wandered into the outdoor dining area only a month before. “For breakfast,” he added, laughing. As I sat cross-legged on a timber plank that was just inches above the water level, I scanned each piece of driftwood for the presence of beady yellow eyeballs. We disembarked on the opposite side of the river. The vegetation was thicker and there was no road in sight. A narrow path seemed to dissolve into giant grasses, which were at least as tall as a double-decker bus. “Where is the jeep?” I asked. “Coming,” said one of the guides. “When?” I asked, the panic rising in my voice. I choked – that was more than six hours away. For all I knew, that expensive pick-up truck may have delivered us into a more remote, and thus more densely inhabited, part of the jungle. I felt like kicking a tree. I stared at Kris. I knew he thought I’d over-hyped our chances of a dangerous encounter — but my calculations were based on the idea that it would only take one to bring us down. 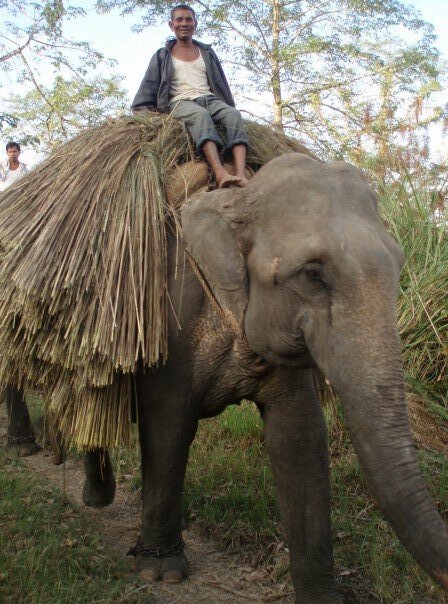 Though I wanted to abort the jungle safari altogether, I grudgingly decided it would be easier just to get on with it. The eldest guide provided short, sharp advice about escaping from animals bigger and faster than us. The one-horned rhino was ranked top of our danger list, as they have a sharp sense of smell and an inclination to charge at anything perceived to be a threat. If confronted by one, we were told to run in a zigzag, as rhinos have weak vision. I was dubious about my ability to execute the strategy, because it seemed counter-intuitive. My overwhelming instinct would be to flee – fast, in a straight line – rather than tap-dancing my way away from a two-tonne behemoth. The alternative was to climb a tree – something I hadn’t attempted in a decade. Our third and last defense, and the one applicable to all other less-than-friendly species, was the guides themselves, who carried ominously light sticks. Although Kris and I would be sandwiched between the two guides at all times, I didn’t waste a second in finding my own stick, which prompted a Dutch snigger from behind. Less than 15 minutes later, the pit-pattering of our feet was eclipsed by the thundering approach of an animal. It sounded like something straight out of Jurassic Park. Although it was very, very close, the animal – perhaps a rhino or an elephant –would remain invisible until it thrashed its way to the path through the grasses. My mind went predictably blank as a guide hoisted me up the closest tree. Kris hopped from foot to foot below, and I narrowly avoided dropping my camera on his head. Maintaining my grip on the branches was difficult because I was shaking and sweating heavily – I was terrified that if I actually saw a rhino, I’d simply fall out of the tree in fright, and would impale myself on its single horn, kamikaze-style. But thankfully, quietness returned before we ever had the chance to identify what ruptured it. When the frightened birds began to resume their places among nearby branches, we descended to the path. I found a bigger stick and we pressed on. A reddish-brown, half-coiled snake basked in the sun a few feet away. I shivered despite the heat and resented the lazy stares of two small crocodiles on the riverbank. Our guides identified tiger track marks and rhino faeces, which I duly photographed. The march of insanity adjourned for lunch, after a quick visit to a tiger sanctuary. 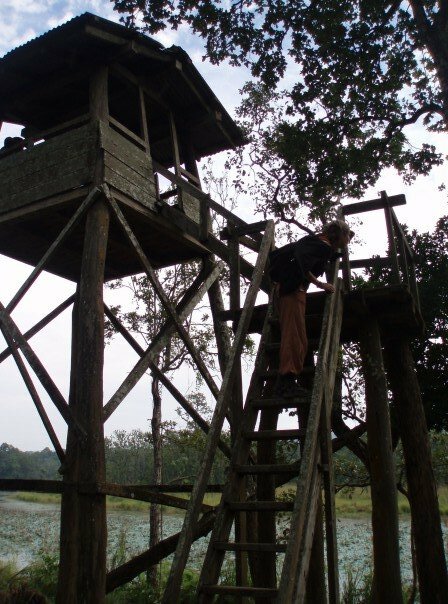 From the watchtower’s vantage point, we observed a Nepalese army troop moving stealthily through the yellowed grasses. Their blue and purple camouflage provided a brilliant, unintended contrast. In 2010, the Nepalese government dedicated almost US$700,000 to an anti-poaching fund for rhinos, though is yet to agree to the army’s request to shoot poachers on site. We arrived at a crocodile breeding farm around 2pm. As I observed even the tiniest of them, fresh from the egg and with pint-sized teeth, I fought uncharitable thoughts about their existence. When I found myself regarding it as “stubbornly long-term,” I realised how easily fear mixes with hostility. But to my surprise, I also became foolishly familiar. During the final hour of our jungle walk, our guide pointed to a large crocodile less than four metres away. With the guide’s permission, I crept closer to photograph it, while pressing my body flat against a tree. My photos were nothing special, and I often wonder how many seconds that crocodile needed to make fatal contact. Perhaps only half of one. I threw the book on my bed and headed out to find momos. I wanted to put my stupidity behind me, but not before a long session at an internet café, where I recounted my ‘Jane of the Jungle’ story to friends. As I was paying up, I noticed a framed portrait above the counter and enquired about the subject’s identity. “Very brave,” I murmured, as my appetite disappeared entirely. I fixed my eyes on the back of the taxi driver’s head, willing him to outmanoeuvre every vehicle on Kathmandu’s busy streets. It wasn’t that we were travelling slowly, but I longed for excessive speed. A knot of anxiety had formed in my stomach, and nothing but a swift arrival at the airport could unravel it. 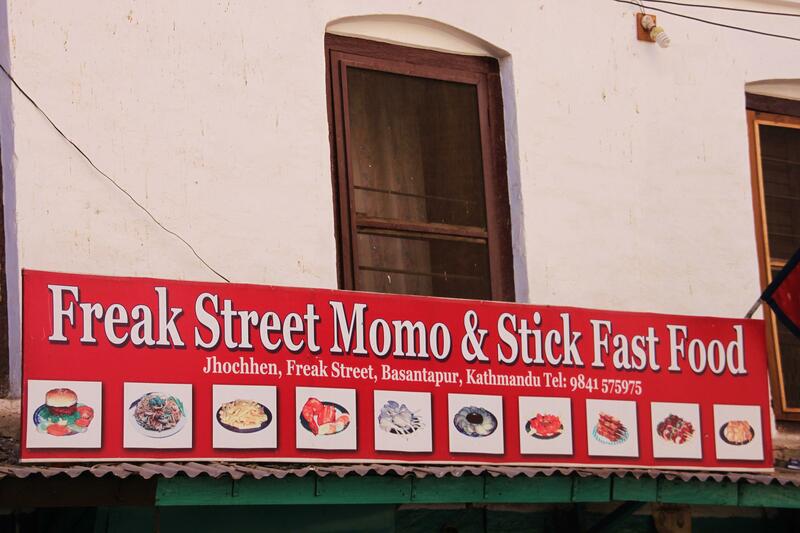 A leisurely lunch and an inappropriately long wander along Kathmandu’s famous hippie hangout, Freak Street, had placed my travel companion and I in danger of missing our return flight to Dhaka. As we shuffled our way along a curving, sheep pen-like queue to enter the departure terminal, I noticed a sign pasted to the window announcing a delayed flight. It wasn’t ours. Whilst I was once stupid enough to miss a flight from London to Rome, and then again from Rome to London, it occurred to me that, over the years, none of my flights have been delayed, let alone cancelled. Shortly afterwards, for the sake of irony, I would regret not having spoken this thought out loud. As the latest of latecomers, we took our place at the end of the check-in line for flight BG704. Although there seemed to be at least 100 passengers ahead of us – some of whom were sitting cross-legged on the floor – I wasn’t overly bothered. I was simply content that we’d made it. And because we were the very last in the line and therefore had no position to covet, we decided to abandon queuing altogether. We walked to a nearby shop, ordered cappuccinos and read our books on the seats provided. As an escalator obstructed our view of the line, we set an alarm to go off every 15 minutes so that we could inspect its progress. We smugly reasoned that we would resume our places when it shrank to a reasonable size. “No improvement,” said my travel companion, after the first quarter of an hour had elapsed. I don’t remember his exact words when he returned a second time, but I certainly recall their impact. First came disbelief, which was followed by confusion and complemented by alarm. After a minute or so, a small measure of excitement crept in to compete with the rest. I was about to discover what happens to passengers when pilots get very, very cross. Every Biman flight was cancelled: not just on October 28, but indefinitely. It was easy to make our way to the front of the counter, because by this stage everyone in the now-futile queue had given up on the effort of standing. Well, almost everyone. We watched in awed horror as a Spanish would-be passenger let forth a stream of abuse at a Biman airline official. We listened to him refuse the offer of free hotel accommodation. Eventually the Spaniard’s temper cooled by a couple of degrees and he switched to muttering under his breath to no one in particular. Then, as if on cue, a Bangladeshi man, dressed in a smart t-shirt with the word “Sydney” embossed on his right chest, flapped his passport against the counter and repeated a milder version of the Spaniard’s sentiments to the same official. To the latter’s credit, he remained unruffled, and within minutes, all real and potential complainants – around 20 of us – were shepherded back outside to the taxi rank. However the bulk of the passengers were simply left behind. They were young, glum, Nepalese men, easily identified as migrant workers by their garishly coloured baseball caps and un-creased t-shirts bearing the names of manpower companies in exaggeratedly cheerful fonts. I don’t know what happened to those men over the next two days. My travel companion suggested that they might have been provided with dormitory accommodation, or perhaps something more uncomfortable. Without knowing the truth, it’s unfair to speculate. But it did seem terribly unjust that the foreign passengers were treated with utmost priority, as we had all paid (more or less) the same price for our plane tickets. And it’s unlikely that many – if any – of the migrant workers had family to stay with in Kathmandu, as many are compelled to leave their homes in remote rural areas due to the scarcity of work. Furthermore, as several newspapers reported, the travel delays caused countless numbers of migrant workers to lose their jobs before they even had the chance to begin. As the “privileged 20” stood in the fading sunlight while waiting for answers, a sense of camaraderie quickly developed. “Where do you need to be?” we asked one another sympathetically. No one would miss a wedding or a funeral, though a pretty Singaporean woman was anxious about having little time to rest before starting her new job as an autistic therapist. As it turned out, the Spaniard was due to meet a friend in Singapore. “An old friend,” his girlfriend emphasised. I felt most pity for a 38-day-old puppy, who was purchased from Nepal on account of its competitive rates for part-pedigrees. He was a tiny, yet-unnamed, snow-white ball of fluffy loveliness – intended as a surprise for a bereaved canine-loving family member in Dhaka. As the puppy cowered inside a pint-sized cage resting on a luggage trolley, he cried as only a being so new to the world can. I lent down to stroke his little wet nose and he promptly fell asleep. I wondered what his dreams might consist of, should he have any. Though we weren’t flying, the rumours certainly were. One person said that the strike was due to the appointment of foreign pilots to the state-run airline; others said that an afternoon meeting with Prime Minister Sheikh Hasina had gone horribly wrong. The only accurate information we possessed was that the partial strike had turned total, just moments before we were due to board. We knew nothing of the pilots’ anger over the Bangladesh Airline Pilots’ Association’s decision to increase the retirement age from 57 to 65 without providing the same insurance entitlements to those who grew older than the existing retirement age. The stranded passenger fear-mongers (myself included), wrongly proposed that no high-level meetings involving Biman’s feuding management and pilots would be held over the weekend. We rued the fact that it was Thursday. Some went even further by suggesting that the pending court decision would leave us stranded for at least a week. And for some reason, we collectively assumed that we would be placed in a “Biman hotel” (so far as I know, no such thing exists, but it was nonetheless criticised for its anticipated lack of quality). But as I observed the starched maroon uniforms worn by the two men who appeared to be responsible for allocating our rooms, I felt certain that wherever it was we were going would be a vast improvement on the 600 rupee hotel room I’d checked out of that morning. But my wildest dreams were to grow dim in comparison. As the bus rolled into a mile-long driveway surrounded by manicured lawns and tastefully arranged water features, I heard someone whisper the obvious, “Five stars.” I playfully punched my travel companion in childish delight. Although I had numerous deadlines pending, I hoped that my editors would understand my predicament (they did). Once assembled in a grand outdoor lobby, the stranded passengers began asking questions that were of an altogether different nature from those uttered at the airport. Yes, yes, and yes. I signed for the key – an electronic swipe card – and glided along a long stretch of regal green carpet to Room 1019. In a word, I’d sum it up as palatial. Much has been written about the misery endured by Biman’s stranded passengers, who were estimated to number in the thousands. I have no idea why we in particular were provided with rooms that cost $230 a night, or whether our compensation for the inconvenience was uniquely generous. Even the shortest of airline strikes can decimate a carrier’s profits – a fact that British Airways is reminded of time and again. According to the UK union, UNITE, the troubled airline loses at least 24 million dollars a day when its staff go on strike. Whilst this was the first time in over 20 years that all Biman’s domestic and international flights were cancelled, I shudder just to think of the bill accumulated at the Crowne Plaza Hotel in Kathmandu. 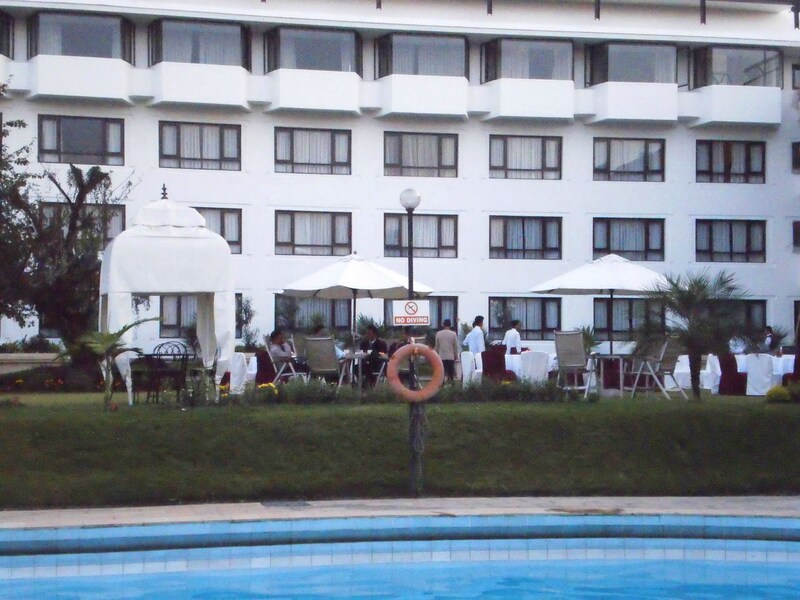 Minimal savings were made the following day when we were transferred to a four star hotel. My room had a plasma screen TV and I continued to gorge myself on buffet meals. I even went for a swim, but was told off for wearing a t-shirt rather than a swimming costume. The only difficulty I encountered – and I admit that it’s petty – was that I couldn’t afford to use the internet at either hotel because the minimum charge was over 600 rupees. I used a stopwatch to make a one-minute “I’m okay” phone call to my parents’ answering machine in Melbourne. While lounging around late into the night with three new Bangladeshi friends, a text came through from a wife in Dhaka. The strike was off. A late-night meeting with Sheikh Hasina’s assistant personal secretary and Biman’s senior pilots had provided sufficient assurance that their demands will be seriously considered. Only time will tell what this may amount to. And so, two lavish days later, we successfully checked in for a Dhaka-bound flight. Other than an argument over whether a Bangladeshi passenger had to pay the penalty for overstaying his visa, there’s little point in elaborating further – it was just a boring old flight.